Is there an audition process to be a member of the UCMB? No, marching in the UCMB is a voluntary elective! All the skills necessary to be successful in the UCMB are developed throughout the marching season. There is a placement audition for the members of the Drumline and Front Ensemble during the summer drum camps. Here is a link with more information, as well as the materials for the placement audition: http://uconndrumline.org/join. What additional steps do I have to take in order to join the UCMB Drumline, Front Ensemble, or Color Guard? In the case of Drumline, Front Ensemble and Color Guard, we hold several weekend rehearsal camps throughout the summer where prospective and returning members work on their performing skills to make sure all are up to our high performance standards. Drumline instrument assignments are determined through these camps. Here is a link with more information, as well as the materials for the placement audition for Drumline and the Front Ensemble: http://uconndrumline.org/join. During the Fall semester, Drumline, Front Ensemble, and Color Guard have an additional rehearsal on Tuesday nights 7:00-9:00 PM. So be sure to register for not only Marching Band, MUSI 1108, but also MUSI 3982 Section 005. Can I succeed at academics while being a committed band member? Absolutely! In fact, the average cumulative GPA of our members is a 3.4. We have members from over 100 majors including engineering, business, sciences, and honors program students, and a wide variety of course loads. Being a member of the UCMB helps to develop time management skills. Additionally, the UCMB is a great resource for making connections with other students that share your major. I was admitted to a regional campus. Can I join the UCMB? Yes! 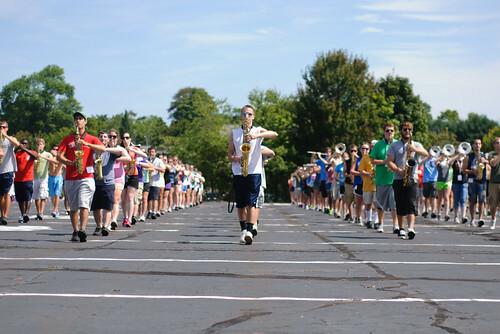 Students admitted to regional UConn campuses are welcome to be a member of the UCMB. Commuting members are responsible for their own transportation to and from the Storrs campus for rehearsals and performances. I've never marched before. Can I join the band? The UCMB prides itself on its composition of students with a diverse range of experience. While many members have participated in marching band prior to joining the UCMB, about ¼ of the band has had little to no marching experience. Our instructional procedures during preseason and throughout the regular season quickly bring new marchers up to speed. Am I expected to provide my own instrument? How often does the UCMB travel during the season? The UCMB travels from Storrs to Rentschler Field in East Hartford for every home football game during the regular season. The UCMB performs in two parades and two exhibition performances around the state. Usually one regular season away game may be added to the schedule (such as the band’s recent trip to Yankee Stadium for UConn vs. Army), however these are usually limited to one per semester. If presented the opportunity, the UCMB also performs in a bowl game during the semester break. Will I receive course credit for being in the UCMB? Yes. The UCMB is not only the largest student organization on campus; it is also an academic course. All members must register for MUSI 1108 when enrolling in classes. The band meets during the week on Tuesday and Thursday from 4:00-6:00 PM and Friday from 3:35-6:00 PM. How often does the UCMB rehearse? The UCMB rehearses Tuesdays and Thursdays 4:00-6:00 PM, and Fridays 3:35-6:00 PM. What happens if I have a conflict with the rehearsal schedule? All members are expected to be present at all performances and rehearsals (including a possible post-season bowl game). Members of the UCMB should make all attempts to schedule classes outside of designated rehearsal times. Most courses offered by the university do not overlap with our schedule; however some upperclassmen may need to take a required major course only offered during rehearsal. Freshmen and sophomore course requirements usually offer greater flexibility and should not warrant a conflict. All conflicts (rehearsal or performance) must be approved by Director of Bands Dr. David Mills. Do band members move on campus early? New members will move in on Saturday, one week before the other freshmen move in. Returning members will move in on Monday morning (one week before classes begin). Where will I live when I come for preseason? All members who will be living at the Storrs campus will be able to check into their university assigned rooms for the fall semester upon arrival at preseason. This is a great advantage as you will avoid the rush typical of freshmen move-in day. The university does not provide housing during preseason for commuting band members. Please contact us if you commute and would like the convenience of staying nearby with another member. Detailed instructions for early check in will be provided to all members as preseason approaches. Are members required to purchase their own uniforms? Uniforms, shakos, berets, gloves, baseball caps, winter hats, and warm-ups will be provided for band members during the season at no cost. For new members, marching shoes must be ordered at preseason, also for no additional cost. Long black socks are essential for the season and must be supplied by the band member. Do music majors belong in the UCMB? Yes! While there is no marching band requirement for music majors, many music majors are members. The marching band is an invaluable experience for those pursuing music education. It provides opportunities to learn new instruments, to teach and lead peers, and to aid in band operations and logistics. I'm interested in learning a new instrument...is that possible? Yes! Many of our new and returning members decide to learn a new instrument, and are very successful in doing so. We are especially in need of mellophones, baritones, trombones, and tubas, as well as pit percussion and color guard. During the spring semester, a brass conversion class is offered to all band members. If you think this may be an option for you, please feel free to contact us. Do I have to be a music major to be a member of the UCMB? No! The UCMB has members that represent nearly all the majors on campus. Within the marching band there are usually 40-50 are music majors. How do I join the Pep Band? Pep Band members are selected from Marching Band members who choose to audition. The Pep Band audition takes place in November and will consist of major scales, a prepared excerpt (posted ahead of time), and the fight song. Pep Band members will be placed in one of four pep bands that will alternate between Men’s and Women’s basketball games. Hockey Band is a pep band option in the Fall for students who are unable to join the marching band, and these members are also eligible to audition for Pep Band in November. Are there any scholarships available for marching band members? At this time there are no scholarships offered by the UCMB, but you can support the Alex Schachter and Family Memorial Scholarship Fund here. Visit the admissions website for more information about scholarships offered by the university. Got your own question? Ask away. Send our recruiting team an email at recruitment@uconnband.org. Call (860) 486-2383 to reach the band office by phone. Do you tweet? So do we. Follow @UConnBand for the latest.